Showcasing stellar stereo imaging and delightfully airy treble, the D9 are a brilliant new entry in the bookshelf marketplace. Those who follow home audio closely are likely aware that there have been some incredible new offerings in the realm of “affordable,” high-end bookshelf speakers lately. 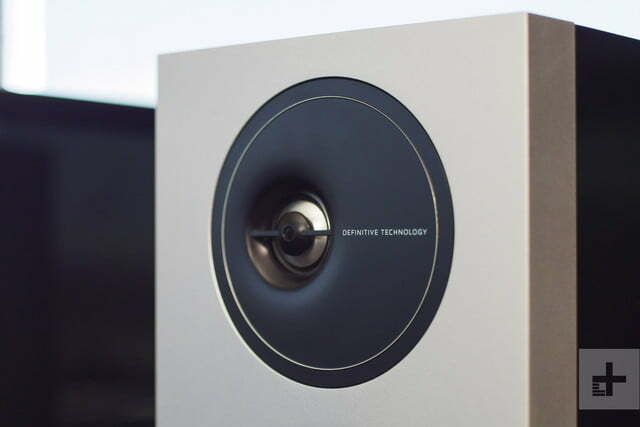 We use the term in quotes, as a $500-600 price point is no drop in the bucket for most of us, but if you’re willing to tighten your belt a bit for the sound of music, offerings like KEF’s Q150 and ELAC’s Uni-fi UB5 are brilliant contributions to the space that allow buyers to relish their favorite tunes more than they’ve got a right to for the money. Looking to continue the trend is the latest from Definitive Technology, the Demand series, which starts around (you guessed it) 500 bones. 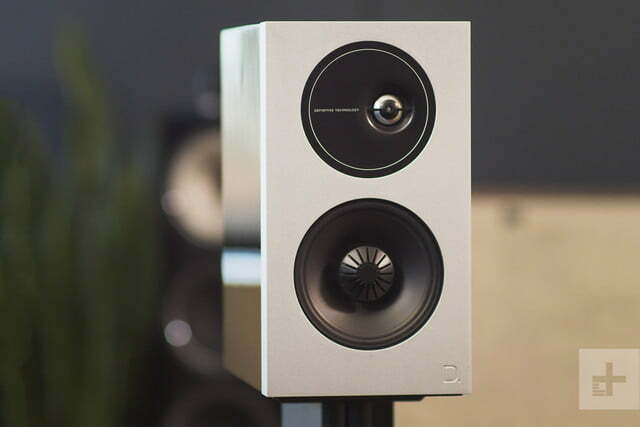 For our review, however, we spent some quality time with the series’ middle child, the D9, which offer striking good looks, impressive build quality, and laser-like precision for a puffed up $800 (though you’ll easily find them for $750 online). 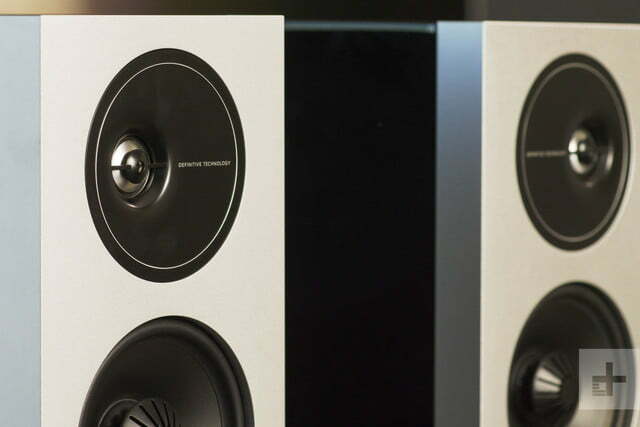 Is all that enough to make this pricier pair the best choice for your hi-fi? Right away, the D9’s gleaming piano gloss cabinets make it apparent where a sizeable portion of your money goes. While the speakers offer similar driver specs as the speakers mentioned above, the exterior design presents a much classier aesthetic than the vinyl wrappings of those competitors. In addition, the D9 sport acoustic screens on both the front face and the top, the latter of which hides passive radiators designed to improve bass response. Pulling away magnetic front grills reveals the D9’s most striking design traits, including offset tweeters rolled out to the sides of their dispersion plates, and turbine-like waveguides pushing out from the midrange cones, combining for an aesthetic pulled straight from ‘70s sci-fi, a la Logan’s Run. 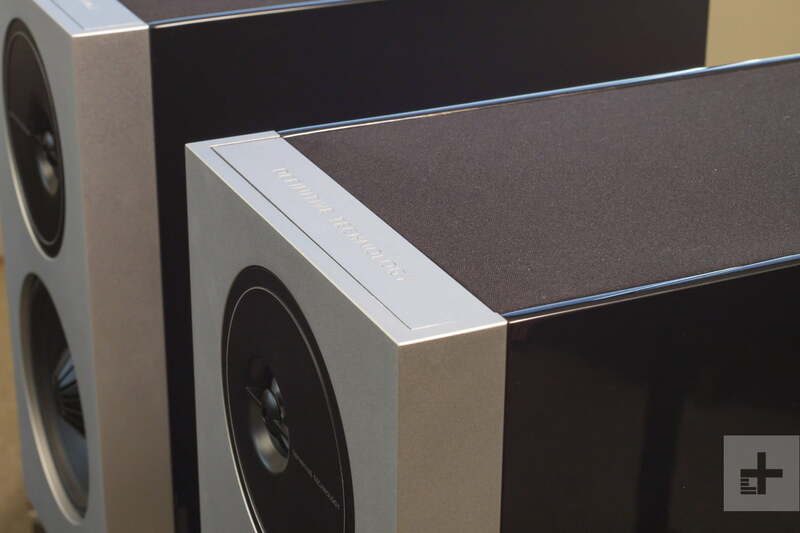 The design sits somewhere between toy-ish and delightfully avant-garde, with an emphasis on the latter thanks to the build quality, making even the tangerine waveguides of KEF’s high-performance speakers look almost ordinary. Suffice it to say, we kept the grills off for our entire audition. Riding in the package are a slim set of accessories, including a sleekly packed booklet with an owner’s manual and a black chamois for keeping a fresh sheen on those sparkling cabinets. Apart from their flashy looks, there’s a lot going on with the D9’s drivers. For starters, the laterally offset, 1-inch aluminum dome tweeters dictate your placement for the pair; there is a right and left speaker in this setup, indicated by labels at the backs of the cabinets, but more logically mandated by making sure each tweeter points outward for a broader and more precise stereo image. Without giving too much away up front, the design apparently works exactly as planned. The tweeters are also covered by Definitive’s 20/20 Wave Alignment Lens, which both guides the higher frequencies, and protects the tweeters from harm. The gloss cabinets present a classier aesthetic than the vinyl wrappings of many competitors. 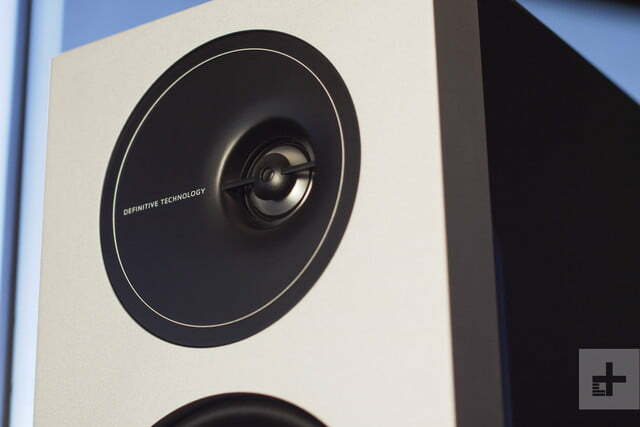 Below each tweeter is a Balanced Double Surround System 5.25-inch midrange woofer. The driver sits behind the brand’s patented Linear Response Waveguide, which not only evokes the feeling that there’s a small chance you might get zapped by a photon beam in your listening session, but also serves an acoustic purpose, designed to offer a wider soundstage for both on- and off-axis listening, as well as better imaging and more natural midrange performance. 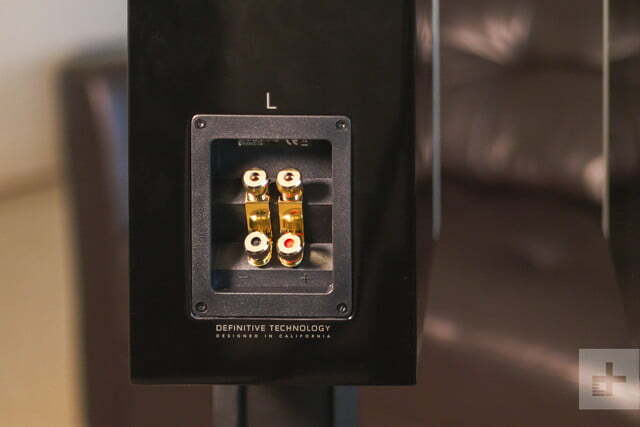 At the back of the speakers, 5-way gold binding posts mark the only deviation from Definitive Technology’s signature black and silver color scheme (go Raiders? ), while a 5 x 9-inch oval bass radiator set in the top of each cabinet means there’s no bass port to be found. 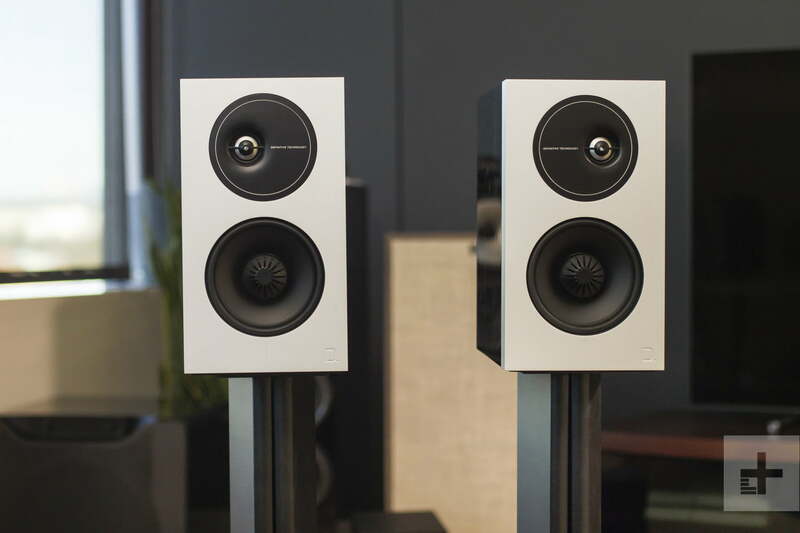 At 6.5-inches wide and about 12-inches in both height and depth, the speakers qualify as average in size for a bookshelf speaker. The claimed total frequency response is 44Hz – 24kHz, with an 8-ohm nominal impedance. Recommended power requirements are 20-150 watts per channel. All of this to say: The D9 are easy to drive and don’t require gobs of power to sound great. The first, second, and third feature we noticed (and loved) most when auditioning the D9 is their astonishing stereo imaging. We’re talking about precision to the inch here, allowing you to pinpoint not only the exact space in which specific instruments are placed in the mix on the horizontal axis, but also the vertical, allowing you to virtually reach out and touch instruments as they pop up in the soundstage. The effect not only leads to vocals that glimmer at the dead center of your listening room, but also impressive accuracy extended to the far ends of the D9’s expansive soundstage. In well-produced jazz tracks like Stanton Moore’s Lauren Z, we were able to virtually chart the instrumentation on an invisible board in front of us like an attack plan in a war room. The cymbals cut perfectly in the lower left-center, bass rides higher and further to the left, while colorful snare drum hits pop closer to the center. A similar experience came with The Beatles’ Lady Madonna. While the piano intro was a bit cleaner than we’re used to, seemingly smoothing over some of the tape hiss, we were drawn deep into the crystalline cymbals pinpointed to the right side, and clear and resonant piano lines with just the right touch of cream. But the real zinger came with the cheery “bah, bah, bahs” in the vocals, which were so clearly delineated, we could hear exactly where each harmony entered, down to the exact moments and places in space where the voices crossed over each other. There’s a delightful zing in the treble, with ultra-clear lines that cut through like a hot blade. Just behind the precise stereo imaging is the D9’s delightful zing in the treble, raising into the belfries with ultra-clear lines that cut through like a hot blade at the transient attack, yet flutter in your ears with a pillow-y landing — starkly clean without ever approaching the sharp sibilance so common in speakers with a brighter touch. That sweet clarity stretches well into the midrange as well, rendering brass with golden resonance and woodwinds with clear and breathy attacks that hit your ears just right. A bright touch is the right way to describe the D9’s sound signature, for better and, at times, for worse. 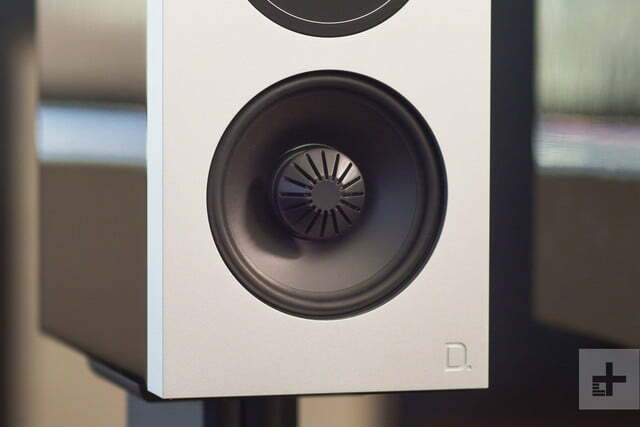 For all their wiles when it comes to clarity, presence, and imaging, we wished for a bit more warmth and weight when it came to the lower treble and midrange registers, especially when compared to the chocolatey goodness of KEF’s Q150. The D9 actually do alright for their size in the bass, offering some foghorn punch to low-riding kick drums and the like, but their tendency to lean on the lighter side of things elsewhere can leave your ears wanting, especially in heavy electronic tracks and hip hop. It’s true that ELAC’s UB5 have some of that lightness in their sound signature as well, but some heavier punch to instruments like guitar and baritone vocals imbue the ELAC’s with more balance. With that said, while textural definition and resolution of detail matches up relatively well between all three speaker pairs, neither the Q150 nor the ELAC UB5 can match the D9 when it comes to transient response in the upper registers, or that razor-sharp stereo imaging. Definitive Technology offers a five-year warranty on both the cabinets and the drivers for the original purchaser. 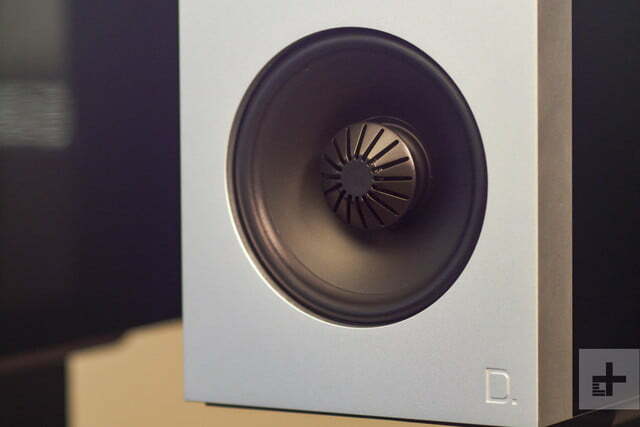 With brilliant precision, laser-like stereo imaging, and a delightfully airy upper register, the D9 are another excellent entry in the strong-and-growing bookshelf speaker marketplace. While some ears may crave more muscle in the middle, if seeking out each micro-tone, string pluck, or vocal entrance in the mix is what you’re after, the D9 are a killer choice. Two obvious competitors exist in the ELAC Uni-fi UB5, and the KEF Q150. While neither of them offer quite as much clarity or precision in the stereo image as the D9, they do have a bit more rev in the lower registers. Where your ears lean may rely on a personal evaluation of each to see which you like best. 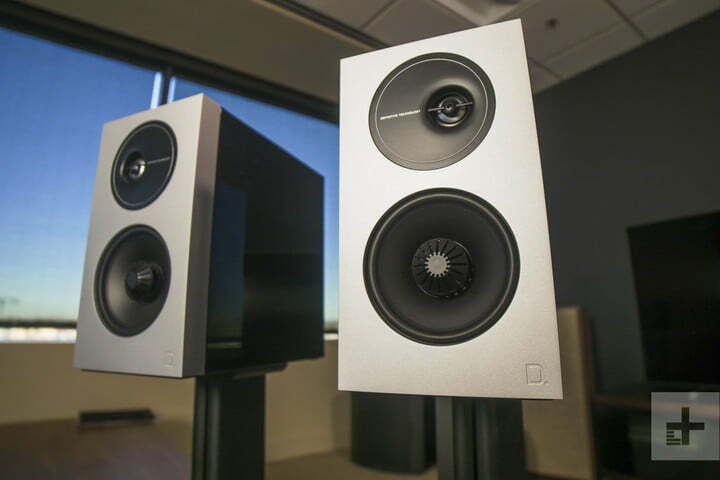 It’s important to note that, while the D9 ask a few more Benjamins than the other two, both the ELAC and the KEF come in basic models with vinyl wrapped cabinets, a decided step down in looks and build quality which won’t wear as well over time. As if to underscore this, the ELAC also come in a slimmer model with “finished satin” exteriors, for a healthy price increase, though the black model still falls a fair bit below the D9’s $750-800 price. It’s a lot to consider, but the good news is we’re confident that any of these speakers will be welcome additions to your listening room. It’s also worth noting that, while we haven’t heard them, the $500 D7 may well be another good option in this price class. 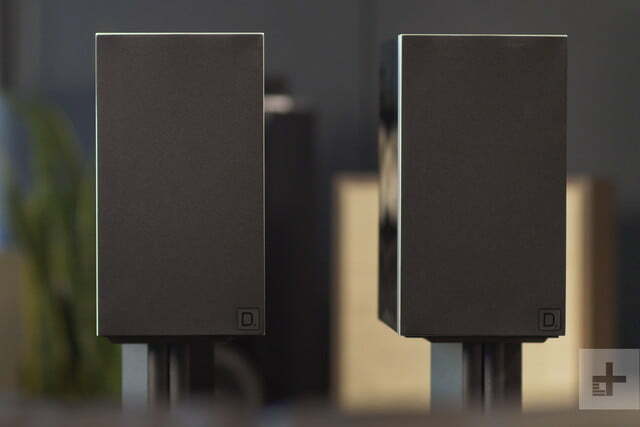 With a solid brand history behind them and robust build quality, these well-made speakers should last as long as you want them to. One caveat there would be the screens covering the bass radiators on top, which look and feel a bit less rugged than the rest of the cabinetry. 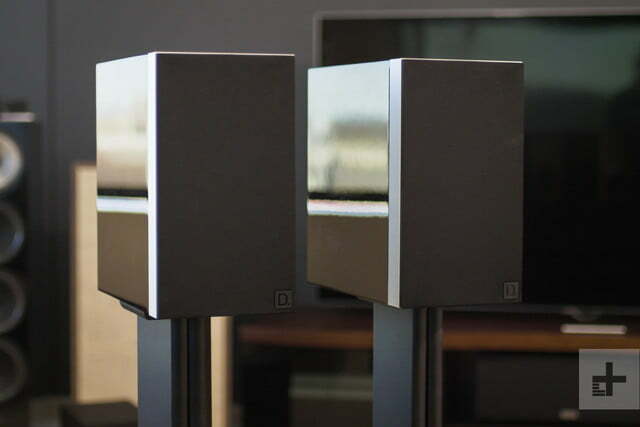 If you’re looking for incredible stereo imaging, a very classy design, and your listening habits tend towards jazz, acoustic, and other lighter recordings, these are the speakers for you. If you care more about your wallet than piano gloss, and you need some extra warmth in the midrange, you may want to consider the other choices we’ve presented. 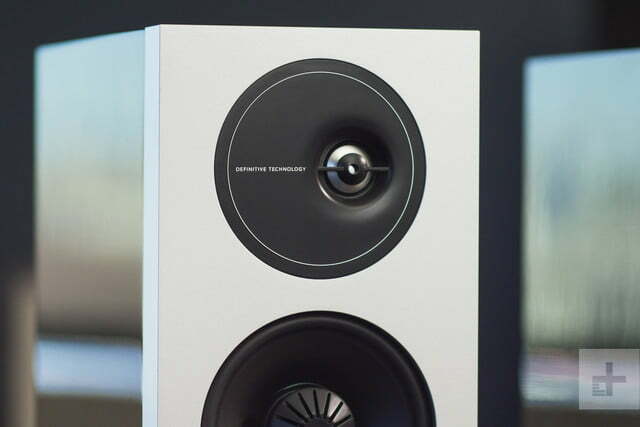 For all the things they do well, it’s tough to spend $250-300 more than some of our favorite speakers in the genre. All that being said, the D9 do some amazing things and come with a classier design to boot. We’d love to keep these speakers in constant rotation on our hi-fi stand, and we’re sure most conscientious listeners out there will too.